Rhode Island residents and new care owners must register their vehicles in order to drive legally on state roads. When registering your vehicle, you can choose from a variety of custom plate designs. 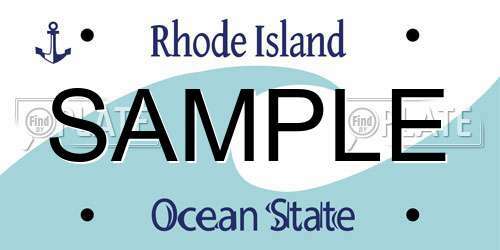 If you want to personalize your license plate in Rhode Island, you can look up available license plate numbers online. All license plates are handled by the Department of Motor Vehicles in Rhode Island. Note: Out-of-state vehicles have 30 days from arrival to register with the DMV. As well, those who purchase vehicles from a dealer will have their registration done by the dealers. Some of these specialty Rhode Island license plates may be the perfect alternative for the standard license plate. Keep in mind that there are additional fees on top of the standard registration costs. You should contact your local Rhode Island DMV to obtain more information about the specialty license plates you can register. Vanity plates allow you to create your own custom characters for your license plate. Before you go to the DMV, you may want to check for available plate numbers. The fees for vanity plates do not include the standard registration fees, see overview of costs for license plates. If you enjoy contributing to local charities, you can register your vehicle and represent your favorite cause. The fees for these places do not include the usual registration fees, taxes, and any additional fees. Remember, registering a charity plate supports the organization and assists their efforts. Upon receiving a disability placard, you are permitted to park in designated parking spots for people with disabilities. If you purchase a new vehicle, you can transfer your license plates without any problems. In the event that the name changes, you’ll have to surrender your plates. You may have to pay a title transfer fee of $51.50 to obtain plates for your new vehicle. When you surrender your license plates, you can bring them in person to the nearest DMV or an AAA office (for members only). In the even that your license plates are lost or stolen, you must apply for replacements right away. Stolen license plates should always be reported to the police to prevent abuse and misuse. When you go to the DMV, you can apply for new license plates and request a duplicate of the original. You’ll be required to wait 90 days before receiving your original plates again. Note: For damaged plates, you can mail them in with an application to have them replaced. Note: Your decals are free when you register your vehicle. You can find out whether a previous vehicle was stolen and other vital information before purchasing by performing an online license plate search. You can also check to see the availability of personalized plates and plate numbers using this online search tool.